The enclave-dwellers live in a stateless limbo. While they are the physical inhabitants of one country, their allegiance is towards another. Shalbari is a composite enclave. Surrounded by Bangladesh on all sides, this piece of India is hermetically sealed, like so many other enclaves in the area. In 1995, this enclave complex is said to have been a witness to 67 murders. Following the violence, 3,000 of the Shalbari residents tried to flee to India, their motherland. 48-year-old Shahidul Islam was among these people. While he crossed over to India with his first wife, dodging the BDR (Bangladesh Rifles), his second wife was caught by the security forces. In 2015, she is “still believed to be in jail somewhere in Bangladesh”. In Seortikursha, an Indian enclave in Bangladesh, which is about 5.8kms from the Indian mainland, in 1994, one Md Atab Ali arranged for his daughter’s marriage with a boy from the mainland. On the ‘appointed day’, the border saw some extensive patrolling by the BDR. Atab Ali’s daughter, twenty years down the line, is still unmarried. Enclaves, in just literary terms, are defined as fragments of one country totally surrounded by another. The world doesn’t have many of these enclaves at this point of time, but among the most fascinating and well-known ones are the Baarle-Nassau and Baarle-Hertog enclave complexes in Belgium and The Netherlands respectively. 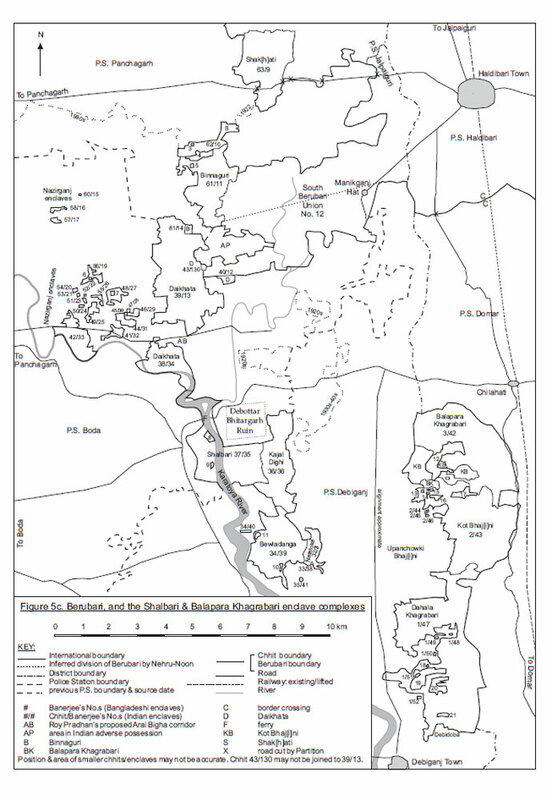 While the Belgium-Dutch enclaves are about 30 in number, there are about 200 Indo-Bangladeshi enclaves, and the latter includes about two dozen counter enclaves and Dahala Khagrabari, the world’s only counter-counter enclave. Dahala Khagrabari is a 0.69kmsq fragment of Indian land, a low-lying jute field, surrounded by Upan Chowki Bhajini, a Bangladeshi piece of land, enclaved within Balapara Khagrabari, an Indian enclave within the Bangladeshi mainland. Counter-enclaves are fragments of land of a country totally surrounded by one country, surrounded by the country the first fragment is a part of. For example, the Teldhar counter-enclaves are fragments of Bangladesh inside the Garati enclaves, which are parts of India, that are finally locked inside Bangladesh. So, basically, you have a part of Bangladesh within a part of India within Bangladesh – and vice versa. India, currently, has 102 enclaves, three counter-enclaves, and one counter-counter enclave in Bangladesh. Bangladesh, on the other hand, has 71 enclaves and 21 counter-enclaves in India. 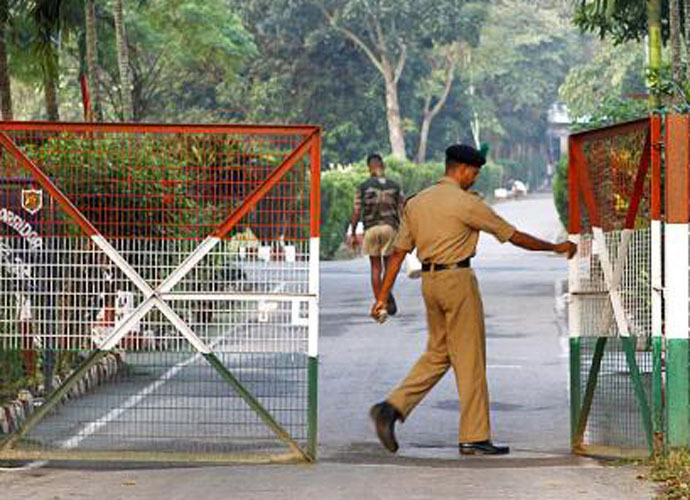 Together, the India-Bangladesh border is peppered with 178 enclaves, 25 counter-enclaves and one counter-counter enclave. In the days of yore, so goes the folklore of the area, the Maharaja of Cooch Behar and the Faujdar of Rangpur spent a considerable amount of time playing chess, wagering villages from their respective domains. When one lost a part of his area, he gave up control over these land islands; and vice versa. In the process, these enclaves were created. A slightly more historically plausible explanation of the enclaves hints at a couple of treaties signed in 1713 by the Mughals and the Maharaja of Cooch Behar, which gave the control of some lands in Mughal territory to Cooch Behar chiefs. These loyal chiefs, who held these lands in Mughal domain, could not be dislodged and thus ended up being enclaved in the area. The 1713 treaty has been lost, but that is still considered the beginning of the enclave problem. Till about 1814, the East India Company was ignorant of these enclaves in Cooch Behar; more so, because they existed at a zamindari/chakla level. In 1935, several enclaves in between Jalpaiguri in India and Rangpur in Bangladesh, and Jalpaiguri and Cooch Behar were exchanged, but the Cooch Behar-Rangpur enclaves remained untouched, largely due to local opposition. In 1947, after the Independence, these enclaves were raised to an international status. The State of Cooch Behar stayed independent till 1949, and after two years of the Indian independence, signed a merger agreement of accession to India. In 1950, after four months of direct Delhi control, the State of Cooch Behar was merged with West Bengal, and the enclaves, which were earlier a problem of the Cooch Behar state and East Pakistan, became an Indian and East Pakistani problem. In 1971, after the formation of Bangladesh, the enclaves were an Indo-Bangladeshi affair. In 1958, Indian Prime Minister Jawaharlal Nehru and the Pakistani Prime Minister Feroze Khan Noon arrived at an agreement regarding some disputed areas on the Indo-Bangladesh (then East Pakistan) border. This led to the infamous Berubari affair. Thereafter, once Bangladesh was a separate country in 1971, Indira Gandhi, the prime minister of India and Sheikh Mujibur Rahman, the prime minister of Bangladesh signed another pact in 1974 to ease the enclave problem between the two countries. This agreement allowed Bangladesh to retain Dahagram and Angarpota, two of the biggest enclaves in the area, in lieu of the southern half of Berubari. In order to connect the Dahagram-Angarpota enclaves with the Bangladesh mainland, a Tin-Bigha (3 bighas = 178mx85m) corridor was to be leased to Bangladesh by India for perpetuity. The Tin Bigha affair saw a lot of disturbances in the area, and opposition from the residents of Mekhliganj, Cooch Behar, of which the corridor was a part. As a result of the severe opposition, the Tin Bigha corridor hung in a limbo. On June 26, 1992, the Tin Bigha corridor was leased to Bangladesh, to massive protests from the residents of the surrounding areas. Several were arrested, and two people were killed. The protests had as the basis that if Tin Bigha was to be leased to Bangladesh, and in return, the Indian enclaves in Bangladesh not exchanged, the lease alone would act as a disincentive to the full exchange of enclaves. However, in 2015, while Tin Bigha is used by Bangladesh to access the Dahagram-Angarpota enclaves, the Indian enclaves in Bangladesh still lie in an inaccessible state. The enclave-dwellers live in a stateless limbo. While they are the physical inhabitants of one country, their allegiance is towards another. The rights and liberties of these enclave inhabitants have been trampled by local, state and national forces to sustain the blood-feud that the communal politics of the area required as oxygen to survive by. The enclaves are immune to the laws of the land; while the areas lie outside the jurisdiction of the surrounding country, the mainland, on the other hand, isn’t capable of intervening in enclave affairs owing to the territorial and political distance from the enclaves. More often than not, these enclaves have acted as a safe haven for smugglers and criminals, who take refuge in these areas in order to escape being caught by the police of one country or the other. After 1951, the censuses of neither India nor Bangladesh provide any information of these enclave-dwellers. It is as if these chhitmahalis (Chhitmahal is the Bangla for Enclaves; chhitmahalis mean enclave-residents) don’t exist, to begin with. No country recognises them as their own; while the country they physically reside in cannot count them as its own; the mainland is too far both territorially and ideologically to think of them as its citizens. If people are killed in an Indian enclave, for example, no case is filed. The area is not under Bagladeshi jurisdiction, and is inaccessible to Indian police officers from Haldibari, the nearest border post in India. The Indian chhitmahalis are paid lower wages than Bangladeshi citizens because, well, they are not Bangladeshi citizens. A certain Dhiru Miyan, a resident of an Indian enclave in Bangladesh, sends his son to a Bangladeshi school since the enclave itself doesn’t have one. The 9-year-old goes to this Bangladeshi school, but once he completes his education, he will have to encounter a bigger challenge – that of getting a decent job. The Indian mainland will not recognise a Bangladeshi degree, and Bangladesh will not give him a decent job because he is an Indian chhitmahali. In most of these chhitmahals, there are no public tube-wells, no medical facilities, no markets, no water. The residents travel to the other country to buy or sell things, and thereby risk being caught in the process. A chhitmahali is a hostage of the Indo-Bangladeshi relations on a given day and time. Marriages don’t take place because the mainland considers these chhitmahalis of lower status than themselves. Before 1952, the residents of these enclaves still enjoyed a certain degree of free movement between the two countries. In 1952, when passports and visas were introduced into the chhitmahalis’ lives, they became locked in these isolated islands. Border crossings were permitted only at designated checkpoints, and more often than not, travelling was beyond the capability of the chhitmahali. Anyone found on this or that side of the border, without a passport or a visa, would be considered a criminal in both India and Bangladesh. In the same year, the chhitmahalis lost their voting rights, too. Ever since, since the people in these enclaves were part of no vote banks, both the countries lost interest in them. Apart from the Dahagram-Angarpota enclaves, which are linked to Bangladesh by the Tin Bigha corridor, the rest of these land islands have been in a geographical and political limbo. When the Land Swap Bill is passed by the Rajya Sabha now, it will set in motion the process of the exchange of enclaves. This Land Boundary Agreement, the current deal, had been signed in 2011, by the then Indian prime minister, Manmohan Singh and Sheikh Hasina, the prime minister of Bangladesh. Prime Minister Narendra Modi is now on his way to Dhaka to expedite the enclave-exchange issue; he is to sign the Land Boundary Agreement along with Hasina sometime next week. Once the enclaves are exchanged, this living laboratory of micro-borders that is the Cooch Behar-Rangpur affair will cease to exist. The residents of the area are already spending days and nights in celebration; after all, a life spent in a stateless limbo will finally see the dawn of a better future. The chhitmahalis will be given the choice of citizenship, whether they want to embrace India or Bangladesh as their country. Several of these enclave-dwellers have faked their identities to travel to the mainland for business and marriage purposes all these days. Many of these people have led a life fraught with tension and uncertainty for a long, long time. When the dotted lines of the agreement finally see the signatures of the two heads of states, somewhere close to one lakh people will see other lines erased. And in the process, will receive the hope of a better tomorrow.